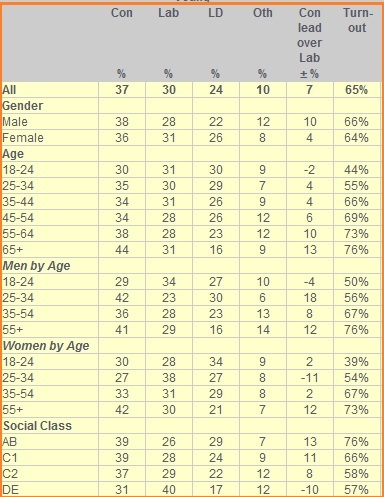 There’s a new ComRes telephone poll out for the Independent and the figures, with changes on the last phone poll from the firm are in the chart above. 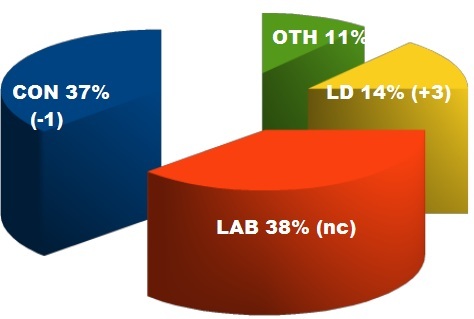 Not much change except the Lib Dem share moving up 3 to 14%. The pollsters finds that Most people still blame Labour for Britainâ€™s economic woes. Asked whether the Coalition is more to blame than the previous Labour Government for the current state of the economy 26% agree while 62% disagree. Amongst LAB voters 48% think the Coalition is more to blame but a surprisingly high proportion 42% disagrees. Asked whether they trust Mr Cameron and Mr Osborne to make the right decisions on the economy, the response was 35% to 55% disagreeing â€“ a net â€œeconomic trustâ€ rating of minus 20 points. LAB’s position is much worse. Only 24% trust Mr Miliband and Mr Balls to make the right decisions on the economy, while 65% don’t â€“ a net rating of minus 41. Amongst LAB supporters 42% do not trust the party leader and Shadow Chancellor to make the right decisions, while 51% do. Voting has been taking place all day in the four state in the 2012 primary season. The polls close at 8pm 0100 UK time when we should get exit poll projections. The big question is the size of Romney’s victory. Florida: Remember how it looked just 9 days ago? How big will Mitt win by tonight? Well after facing probably the biggest onslaught of negative advertising ever in a primary and having two mediocre debate performances the outlook for the ex-house speaker does not look good. Mitt has outspent him by a factor of about seven and his numbers have slipped. Expect to hear claims that Mitt is using the vast financial resources at his disposal to buy the presidency. But how far will Newt be behind? That’s one of the more interesting betting markets. Betfair have three options and I’ve got a small bet on at about 6/4 that Mitt’s margin will be under 12.5%. The bet might add a little excitement to what seems a pretty boring night. A new telephone poll of Scottish voters by Ipsos-MORI for the Times puts support for independence at 39% – which is just one point up on the firm’s last poll in December. The question that was put was the one proposed last week by Alex Salmond – “Do you agree that Scotland should be an independent country?” and which has caused some controversy. In the December poll MORI asked those sampled if they “agree or disagree with a proposal to extend the powers of the Scottish Parliament to enable Scotland to become an independent country, which is no longer part of the UK”. In the last poll MORI found 57% supporting the union while this latest survey has it at 50%. So it maybe that the new proposed wording does have an impact there. Where Alex Salmond appears to have a challenge is in winning over pro-union voters. According to the poll they say they are less likely to change their mind. A total of 82 per cent of of those opposed to independence said they were definite in their view compared to 69% for the other side. 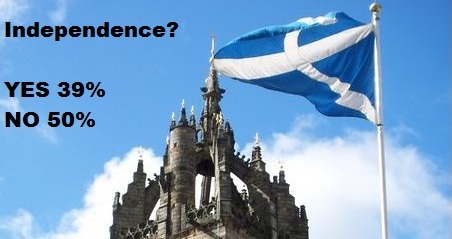 The firm has a good recent record in Scotland. Last May its final Holyrood survey proved to be the most accurate of all the pollsters covering that election. Here are a couple of tweets from with the past half hour. Can Guido secure 73,717 signatures by Saturday? Is he in danger of losing losing the E-petition war? Back in the summer Guido launched a campaign to get capital punishment restored for certain cases of serious murder and he set up a petition on the Number 10 e-petitions site. The aim was to reach the threshold of 100,000 within six months so it would become eligible to be debated in the commons. His move received a fair bit of attention in the media and also prompted a rival petition from those wanting the current ban on capital punishment to be retained. Alas time is running out. The total has to reach 100,000 by the weekend for then it becomes time expired and there’s still some way to go. As can seen from the chart the total of 26,283 is somewhat under the required number. Guido has made up some ground on the “retain the ban” initiative but the big number looks set to defeat both. The lesson from this is that it’s mighty difficult using the e-petition scheme to get on the parliamentary agenda. If an issue such as capital punishment promoted by a popular blog and parts of the national media cannot do it then very little can. How many 16 year olds would bother to vote? Should the franchise be extended? 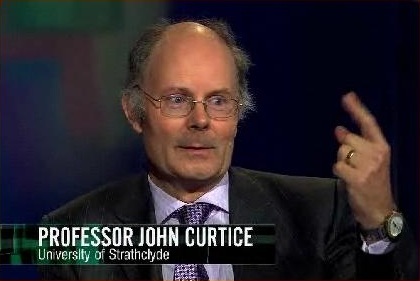 With suggestions from the SNP that the franchise should be extended to 16 year olds in the referendum there was a good article over the weekend by Professor John Curtice of Strathclyde University. Curtice goes on:“…But whatever their views, 16 and 17-year-olds can only possibly make a difference if they actually cast a vote in the referendum. In practice, most would not do so. Those figures themselves could over-state the level of involvement because many 16/17 year olds did not get themselves registered. The experience of the 2010 general election was that the further you went down the age groups the lower the turnout rate. Young women were markedly less likely to turn out than young men. This was produced by Ipsos-MORI shortly after the election. With Florida going into its final day of campaigning tomorrow it looks pretty certain that Mitt Romney will chalk up his second victory which should, surely, provide him with a solid platform to go forward. Nate Silver has produced his latest forecast – 95% chance of a Romney victory. A week ago Nate’s prediction was that it was 75% chance for Newt. That’s how the betting markets see it. He’s 1/25 to win on Tuesday and about 1/7 to win the nomination. This week’s leader ratings from YouGov are just out and all three main party leaders see improvements on a week ago. Camerons “Well/Badly” figures are 46/47 making a net minus 1. Last week it was minus 3. Ed Miliband is on 20/68 which is a net minus 48 compared to 53 last weekend. The improvement is still not enough to be scoring better than Nick Clegg who has had the best week of all following his speech on tax. He has gone from 21/71 last week to 26/64 today. So a net change of plus 12. 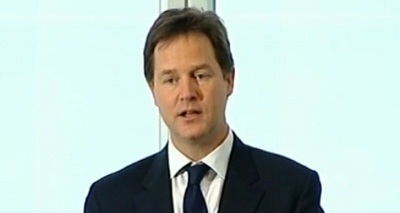 Clegg’s tax speech, which was widely covered and pretty well received, raised questions of whether he was pre-empting Osborne’s budget. Quite what went on within the coalition we don’t know but it’s clear that we are seeing a specific effort on policy differentiation from the yellow team. The last time that Clegg had better YouGov ratings than today’s was last March just after his party’s Spring Conference when the planned NHS changes were centre stage.